The following are cats of the week available for adoption at Kohl’s Cat House. Lincoln is a neutered adult male. He is sweet and seeks attention. Be patient with him if adopted, he will need time to adapt to new surroundings. If interested in adopting a cat, call the cat house to find out more. Tilting Timmy is a neutered adult male. He is shy at first but is also loving and am looking for a new forever family. Be patient with him if adopted, he will need time to get used to new surroundings. Call the cat house to set up a meeting. Volunteers don't always call the animals by the same name. Please be ready to describe their appearance. Kohl’s Cat House can be reached at 541-294-3876 or catsrforever@outlook.com. Visit online at kohlscats.info. Pacific Cove Humane Society has pets available for adoption through its “People-to-People” pet-matching service. Hobo is a neutered, good-looking, dark orange tabby that’s about a year old. He’s loving, playful and has a fang that sticks out over his top lip. He also has a little kink in his tail. His a unique little guy looking for his forever home. 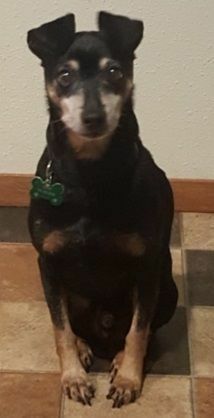 Vegas is a sweet 8-year-old Min Pin that will be neutered soon. He's afraid of cats, good with other dogs and kids. He is loving, smart and needs a fenced yard. Evaluation required. For information about adoptions, call 541-756-6522. The shelter is at 92960 Southport Road in Coos Bay. It is open Tuesday-Saturday, 12 p.m.-4 p.m. Phone: 541-751-2480. Currently adoptable animals can be seen at http://awos.petfinder.com/shelters/OR156.html. Currently adoptable dogs can be seen at http://awos.petfinder.com/shelters/OR223.html. The shelter is open only by appointment. To meet a dog, call 541-662-2062.